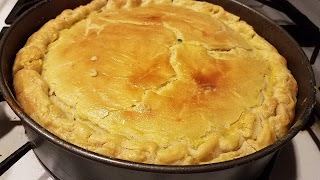 I could not resist today to post this recipe, is Pi day and I am teaching a cooking class on Pies today. When I create classes, I can never pass the fact of what is going around in the world, I love Pastel de Acelgas, which is the Peruvian name for this pie. In the picture I forgot the Eggs, I got distracted and the eggs where off the pie when the pie got sealed. But, it matters not! is delicious, and my husband and kids like it. One for mom! feeding greens to the family has never been easier, anything with 1 lb of butter, better be good. 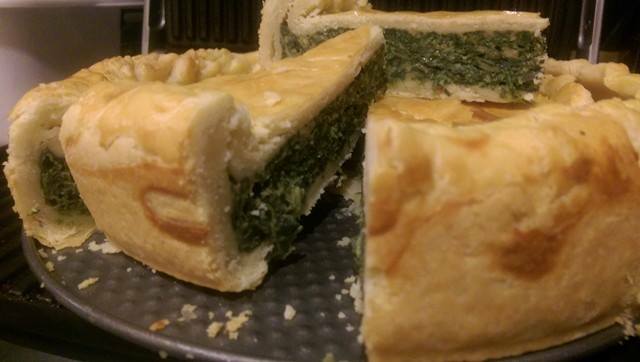 Pascualina; typically known as Spinach and Collard Green Savory Pie in some countries and in others is known as the Pascualina, because is usually serve during Easter time because is a great lent meal. Cold in cubes, Reserve 1 oz. 3. Incorporate the butter. Pulse until coarse. 4. Combine the egg yolks with the ½ Cup milk. 5. Add the milk mixture to the flour, while pulsing at the same time. Until the dough forms into a ball. Wrap and reserve at room temperature. 7. Heat a large skillet and fry the onions until soft. 8. Incorporate the reserved butter. Melt. Add the reserved flour and make a roux, stir roux for a little bit. Carefully add the milk and create a thick sauce, season with salt, pepper, and nutmeg. 9. When sauce is off the fire, and cool a touch. Incorporate the eggs, parmesan, and crackers. Re-season one more time. 10. Stretch ¾ of the dough into a circle, large enough to cover a 10-inch spring form or bottom-loose pie mold. Carefully wrap the mold. 11. Place all the filling in, create the space that will hold the eggs, and place them in. Cover with more filling. 12. Stretch the remaining dough and cover the top. 13. Egg wash the dough and bake for about 30 to 45 minutes.